I recently wrote in the article “Do You Need a Blog for Your Wellness Business?” that a blog post isn’t just a one-off piece of content, it can – and should be a stepping stone to dozens of other re-purposed pieces of content! 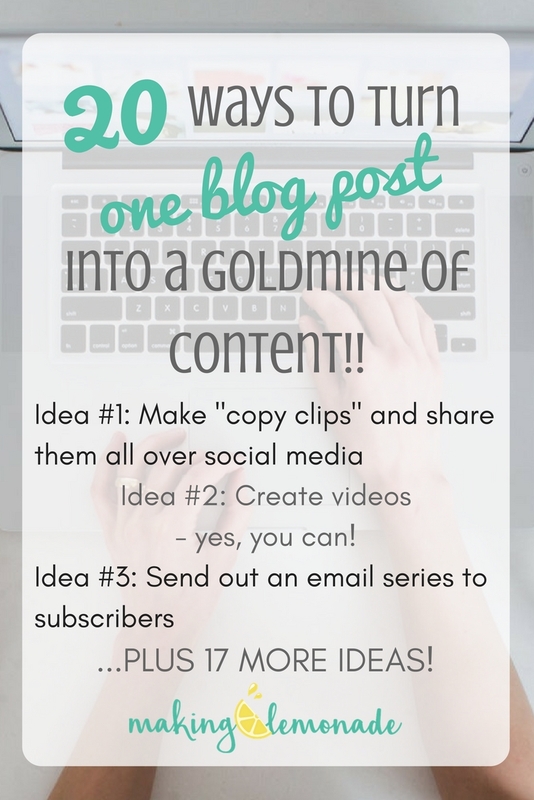 20 creative ways you can take just ONE BLOG POST…and turn it into a gold mine of content!! First, you have to write a killer piece of content – one that has staying power, as in it’s evergreen. Remember to include a prominent and compelling CTA – that’s a call to action (linked to an opt-in resource) for your readers to turn them into subscribers, and then into potential clients or members. You can find out more about this whole flow in this 5-Step Process for Writing Your Wellness Website – even if you hate writing! Share it all over social media, then tweak the copy, change the image and share it again…and then again. Show your post plenty of Facebook love! Post on LinkedIn updates and/or re-post the whole article in the LinkedIn long-post format. Tweet it! Remember you can tweet multiple times from just a single post – we’re talking up to a dozen tweets. Just make each the most compelling 140 words ever. Pin it, and remember to rotate through 2-3 different pin images for the same content. Share it on group boards too! Canva is the app I use to make all of my graphics, including what I pin to my boards. Share a related eye-catching image on Instagram, then use a snippet from the post in the description – and don’t forget your relevant hashtags! The key is to find about 25 hashtags that you can reuse for each category of post you use with a mix of popular and less popular hashtags, says Sean Seale of The Holistic Nutrition Hub. Write a spin-off blog post or “chunk it out” and expand into a post series. Create a video, or multiple videos from it. YouTube, IG Stories, FB Live…it really doesn’t get any easier to “show up” in your brand and positively own that content! Do a webinar on the blog topic. Be a guest on a podcast and talk about that specific topic, even verbally sharing content directly from your post AND offering a link to it, if that’s ok with your host of course. Have you listened to this podcast yet? Kathleen & Karen feature the foremost experts in the Health & Wellness industry. Send out a newsletter to your tribe offering a key tip from the post to entice them into reading the full post. Re-work your content into a fresh, new guest post – just be sure to not take an old post or guest post and submit it verbatim. That’s a big no-no! Visual graphics like memes, quotes, infographics, etc. Looking for some really beautiful on-brand images for your website & social media? Try Wellness Stock Shop – soulful imagery for your wellness biz. Create a piece of “upgraded content” that serves as an in-post lead magnet to capture subscribers. Got a “listicle” type post? Turn it into a checklist! –> SEE END OF POST – BOOM!! Create a quiz – have you tried INTERACT Quiz Builder? Turn the content into interview material and/or a round-up post of experts on the topic or influencers in your niche. Is your article more than 6 months old? Update it! Give it some fresh legs – perhaps some different images, add a video, or even a catchy new title. Create 10-20 image + copy presentation slides (known as a slide deck) with PowerPoint and share on SlideShare – a web based slide hosting service from LinkedIn. Break up an especially long article and create several shorter ones. And last but not least, and this is going outside the bounds a bit, take that ONE POST and combine it with several other related posts (or other pieces of content) to create an e-book, e-course or email series to offer your subscribers, clients and soon-to-be raving fans! my email subscriber list doubled! engagement on all channels went through the roof – I had trouble keeping up with all of the comments, feedback, inquiries and points of “connectivity” — which is a great problem to have! Worth a try I would say! Lather, rinse, repeat – or should I say squeeze out every damn ounce of value, then keep on squeezing. – the Lemonade Crew, that is. I share all kinds of great tips and resources, including done-for-you coaching resources to juice up YOUR wellness business. Check out the cool freebie I’ve got for you right now!